Good people the Triathletes. Open-minded. Like all good Cork people. So when I rocked up to the start line, in the slipstream of Peter Meaney’s Planet X aeroplane, they didn’t giggle much, to my face anyways. 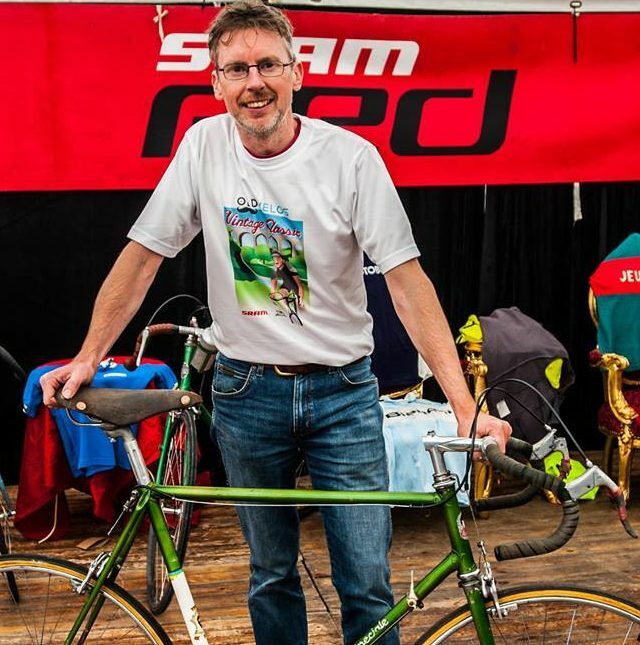 In the two years since I began riding the Cork Triathlon Club 8.4mile training TT’s I’ve turned up on many the vintage bike, but never before on something 60 years old, with whitewall tyres and 3 wheels. Till tonight. I felt like a real triathlete! Cue the ‘will I hold you?’ jokes on the start line and the focus inspiring “5-4-3-2…..” but the following wind had took hold and I rolled off before 1. The straight-line dash seemed fast enough as I coaxed the 56tooth Stronglight chainring from its usual bashfulness. 56×18 was fine for this asphalt before the angles of the skew bridge would sap much of my speed. Over the top and an overeager assault on the bar end gear lever found 56×14 too much to push. Back a notch as I held off Peter from catching me before the ‘e’ in Elm Tree (but he passed me by the final ‘e’ nonetheless). Fine façade on that pub, but heavens their architect obviously doesn’t do roads. I bumped and jostled all the way to Glounthaune (Glownthawn to my UK readers) and settled back into 56 x 18 as eventually the new road rose to meet me. Over the hump I had been passed by countless whirring machines, all setting off in multiples of 30s behind me. Onward to the half way point, a 180 degree turn around a roundabout the size of a paddling pool. I had intended to practice this, but the earlier allure of Peter drafting me to the start line had easily swayed me from the benefits of a practice lap. I approached with temerity. Right hand turns are not my forte, and so I executed what could only be described as the oblong circumnavigation of a merry-go-round, with greenery. Jessica kindly complimented my turn, and stayed as far away as possible and in front from that point on. I was on my own, with a headwind. Amazing the things that go through a blood starved brain in a headwind. I tried pulling as well as pushing on the pedals. I repeatedly counted to seven. I remembered thinking I must write ‘breathe’ on my handlebars. I started counting the number of volunteers of the tidy-towns volunteers, and got peeved by the lack of impressed looks. That much took me past my earlier divet and onto some new tarmac. Jessica stayed safely away in the distance as I noted the price of the cheapest diesel in East Cork. The skew bridge awaited, as did the 20tooth cog and a patient motorist. I rose from the saddle, keeping some weight on the driving left hand wheel hoping to perfect [show-off – ED] the tricyclist’s counter balanced turn. But my speed didn’t warrant it and I goaded rather than glided into the home straight. Head down, eyes fixated, grip tightened, legs crunching a ludicrous gear I heard warmed down riders encourage me on as I prepared to shout my name crossing the finishing line. 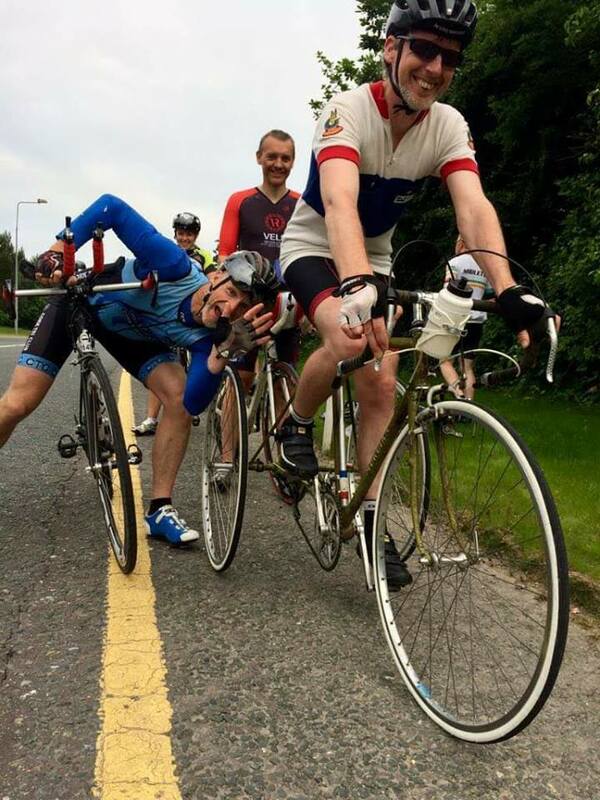 “Don’t think that was necessary” Peter laughed merrily, “well done, how did you get on?” Good people the triathletes. 26:55 and thanks for the time keeping! Next story Molls Gap is easy on a 54inch gear!